Mike Ullery | AIM Media Midwest B-17 Flying Fortress Memphis Belle is unveiled in a private reception ceremony at the National Museum of the United States Air Force on Wednesday evening. The Belle underwent more than 10 years of restoration work to make her ready for her last mission - to keep the memory of our World War II Army Air Corps veterans alive forever and to educate future generations about the sacrifices and heroism made by our Greatest Generation. Mike Ullery | AIM Media Midwest World War II United States Army Air Corps veterans pose in front of the newly unveiled B-17 Flying Fortress Memphis Belle at the National Museum of the United States Air Force on Wednesday. 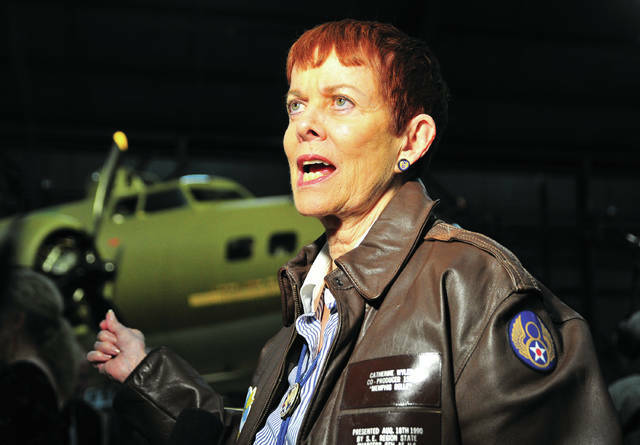 Mike Ullery | AIM Media Midwest Catherine Wyler talks about the significance of Memphis Belle during a private reception at the National Museum of the United States Air Force on Wednesday. Wyler’s father produced the 1944 documentary Memphis Belle and Wyler herself was the producer of the 1990 feature film by the same name. Mike Ullery | AIM Media Midwest Robert Morgan, Jr., son of Memphis Belle combat pilot Robert Morgan talks about his memories of Memphis Belle and his father, during ceremonies at the National Museum of the United States Air Force on Wednesday. 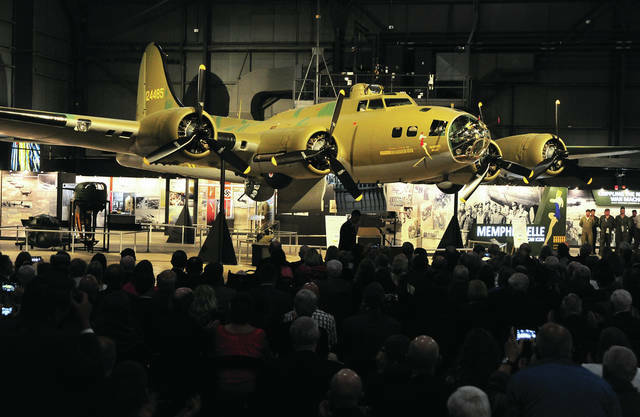 B-17 Flying Fortress Memphis Belle is unveiled in a private reception ceremony at the National Museum of the United States Air Force on Wednesday evening. The Belle underwent more than 10 years of restoration work to make her ready for her last mission – to keep the memory of our World War II Army Air Corps veterans alive forever and to educate future generations about the sacrifices and heroism made by our Greatest Generation. 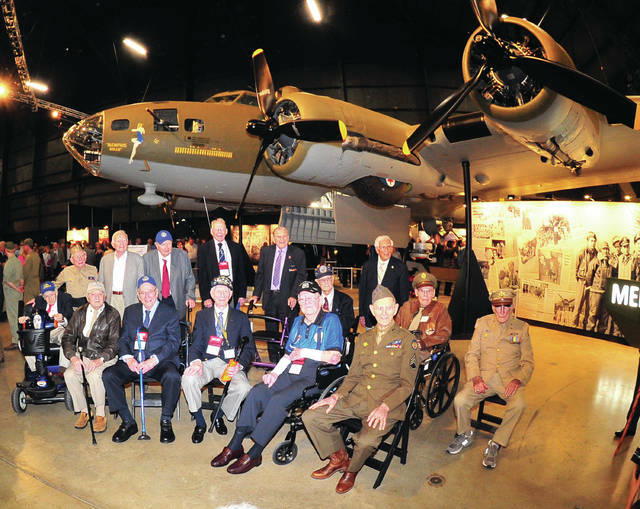 World War II United States Army Air Corps veterans pose in front of the newly unveiled B-17 Flying Fortress Memphis Belle at the National Museum of the United States Air Force on Wednesday. Catherine Wyler talks about the significance of Memphis Belle during a private reception at the National Museum of the United States Air Force on Wednesday. Wyler’s father produced the 1944 documentary Memphis Belle and Wyler herself was the producer of the 1990 feature film by the same name. Robert Morgan, Jr., son of Memphis Belle combat pilot Robert Morgan talks about his memories of Memphis Belle and his father, during ceremonies at the National Museum of the United States Air Force on Wednesday. 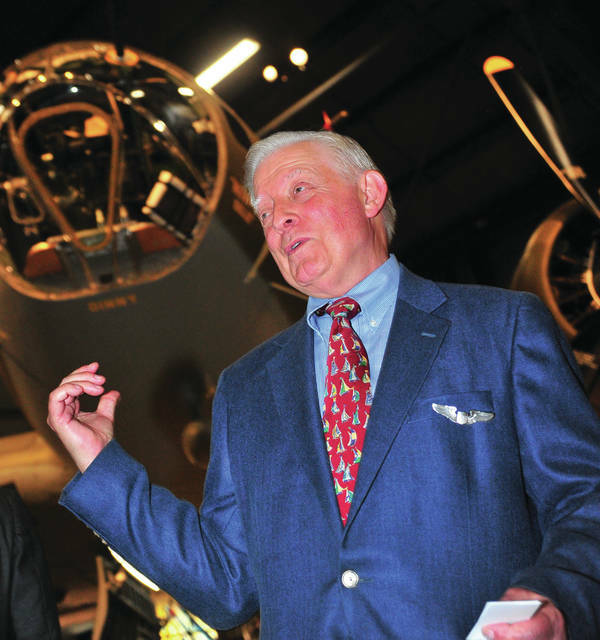 Mike Ullery | AIM Media Midwest B-17 Flying Fortress Memphis Belle is unveiled in a private reception ceremony at the National Museum of the United States Air Force on Wednesday evening. The Belle underwent more than 10 years of restoration work to make her ready for her last mission – to keep the memory of our World War II Army Air Corps veterans alive forever and to educate future generations about the sacrifices and heroism made by our Greatest Generation. https://www.urbanacitizen.com/wp-content/uploads/sites/36/2018/05/web1_051618mju_nmusaf_belle1_ne2018516222030250.jpgMike Ullery | AIM Media Midwest B-17 Flying Fortress Memphis Belle is unveiled in a private reception ceremony at the National Museum of the United States Air Force on Wednesday evening. The Belle underwent more than 10 years of restoration work to make her ready for her last mission – to keep the memory of our World War II Army Air Corps veterans alive forever and to educate future generations about the sacrifices and heroism made by our Greatest Generation. https://www.urbanacitizen.com/wp-content/uploads/sites/36/2018/05/web1_051618mju_nmusaf_belle2_ne201851622214198.jpgMike Ullery | AIM Media Midwest World War II United States Army Air Corps veterans pose in front of the newly unveiled B-17 Flying Fortress Memphis Belle at the National Museum of the United States Air Force on Wednesday. https://www.urbanacitizen.com/wp-content/uploads/sites/36/2018/05/web1_051618mju_nmusaf_belle3_ne2018516222210680.jpgMike Ullery | AIM Media Midwest Catherine Wyler talks about the significance of Memphis Belle during a private reception at the National Museum of the United States Air Force on Wednesday. Wyler’s father produced the 1944 documentary Memphis Belle and Wyler herself was the producer of the 1990 feature film by the same name. https://www.urbanacitizen.com/wp-content/uploads/sites/36/2018/05/web1_051618mju_nmusaf_belle4_ne201851622237980.jpgMike Ullery | AIM Media Midwest Robert Morgan, Jr., son of Memphis Belle combat pilot Robert Morgan talks about his memories of Memphis Belle and his father, during ceremonies at the National Museum of the United States Air Force on Wednesday.